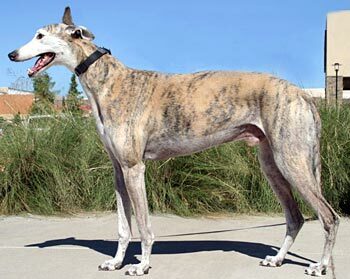 Buzz, aka Boogie Rock, is a handsome 7½-year-old brindle male born February 27, 2001. Buzz's sire is Rocksteady Eddie and his dam is Boogie Dog. 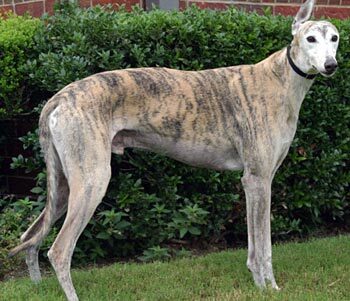 Buzz raced in Texas, starting at Gulf Greyhound Park on October 4, 2002, and ended at Corpus Christi on January 10, 2003. He was a release to the Oak Cliff Shelter due to an injury to his right front foot. Buzz was in a home for over 4 years, but, unfortunately, it was not to be his forever home. He has definite "personality ears"! 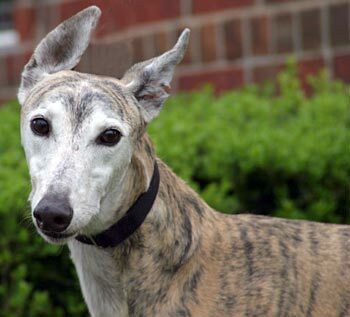 Buzz is a sweet, affectionate boy and is in a foster home with several other greyhounds. He is NOT cat safe, but appears to be small animal tolerant. Buzz is a BIG, happy, friendly boy who wants to be in the middle of all the action! He gets positively joyful at meal times, even pogo-ing up and down in delirious expectation of whatever is put in front of him. It doesn't matter to him that its the same chow twice a day: feeding times are always cause for celebration! Buzz is just as happy to go for car rides; quickly jumping in the car and then settling down, glad to just be riding along. He loves to get into bizarre, often uncomfortable-looking positions on his dog bed. I have a photo of him lying on his stomach, with his head tucked so far into his chest and pushed under the dog bed that it looks painful, but he's fine twisting up into a pretzel and sleeping! Buzz has never had an accident in the house, uses the dog door when he needs to, but prefers that he is by my side at all times. No matter what I'm up to, he's there to lend a paw. And, he will definitely let me know when its time for some loving! Buzz puts his big head under my hand or arm, and tries to flip it onto whatever part needs some scritching. The boy knows what he wants and how to get it! But, being a true Greyhound, he will quickly shift gears and curl up to sleep thru the night, or take his many beauty naps. 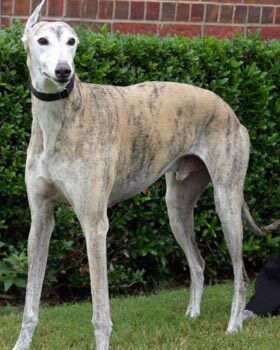 He is very sweet to his foster brothers and sisters (3 other greyhounds and a whippet) but would love to get his paws and jaws around those pesky kitties he can see from the windows. Buzz has a loud bark, but we are working on using his "inside voice" when he needs attention and leaving the "outside voice" for when there are true emergencies (like kitties in the yard) and he is learning very quickly. Buzz would do well in an active home with older children and no cats... He is big and strong so he needs an equal to walk him outside (especially when those pesky cats dare come into his view), but in the home his size is only an issue when he gets into his bouncy mood. Be prepared for this boy to want to be attached to you at the hip! He is a goofy, funny, loveable boy who needs and deserves a family for him to love and amuse for years to come.